Luxury Townhome with 3 Fireplaces, Great Views and Excellent Location! This absolutely beautiful, luxury townhome is located on Prestigious EDSON HILL RD halfway between the village of STOWE and STOWE MOUNTAIN SKI RESORT, Mt. Mansfield Ski area. 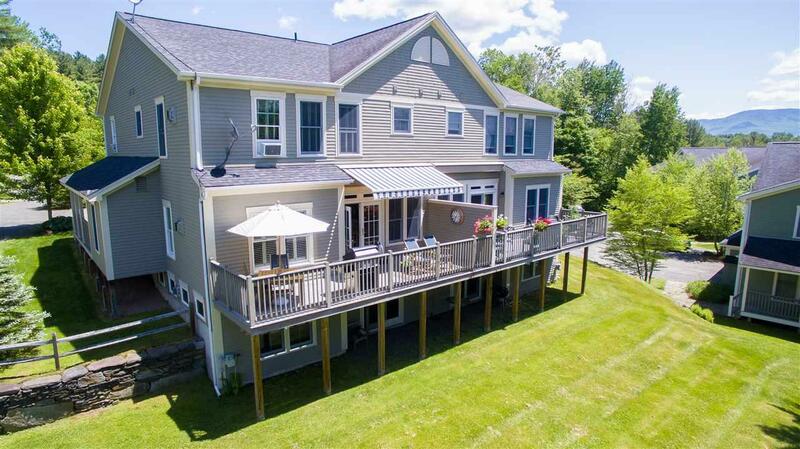 You can walk a few steps from your townhome to the MOUNTAIN SKI SHUTTLE on MOUNTAIN ROAD, the Stowe Recreation/Bike Path, hiking and snowshoe trails on Stowe conservation property, Wiesnner Woods, and mountain bike a short pedal to many trails. The Savage Pond condo property has 4-shared acres surrounding the eight-units. This 3000 square foot town home has high-end rustic cherry wood floors throughout the first floor, master bedroom and upstairs hallway. Hunter Douglas plantation shutters grace the downstairs windows to create privacy and/or shade while retaining an open spacious living area. Upstairs, Hunter Douglas custom shades are installed in each bedroom. The main floor has a custom installed green slate and copper gas fireplace with remote controls for various fire looks and heat levels. The second floor master has a new custom fireplace as well. The kitchen is a gourmet cooks dream with Kitchen Aid appliances, and rare green striated granite from Vermont quarries. The first floor also has a bonus room or office with direct access to a bathroom and shower. Much of furniture and furnishings are negotiable. Best of all, HOA fees are incredibly low, $350/month. Courtesy of Ed Stahl of Pall Spera Company Realtors-Stowe.